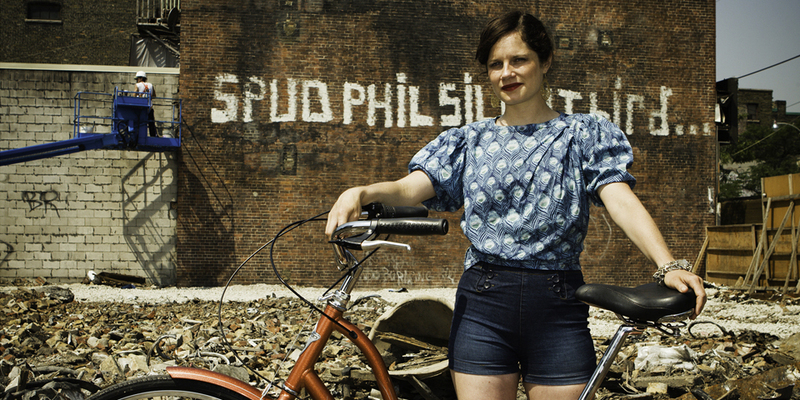 The first in a series of short interviews with Toronto’s fashionable pedal people. Tricks : Wearing high heels while riding my bike. Sometimes the heels get scratched, or fall off. This is a problem. I’ve shown my bum a few too many times in a skirt. Tips : I tie elastics around my skirt hems to keep them in and always use the ball of my foot to grip the pedal. It is actually easier to ride in heels than walk in them because you are sitting. On coordinating : In the past when I rode a mountain bike I was aware that heels and sporty motif do not always work together. Besides being aesthetically unpleasant, heels in clips just don’t work. I would love a bike lane on Queen Street. I would also like to start a women owned and operated personal shopping courier service, called “Heels on Wheels.” I can already picture the outfits! See our Heels on Wheels from the second issue of dandyhorse here.